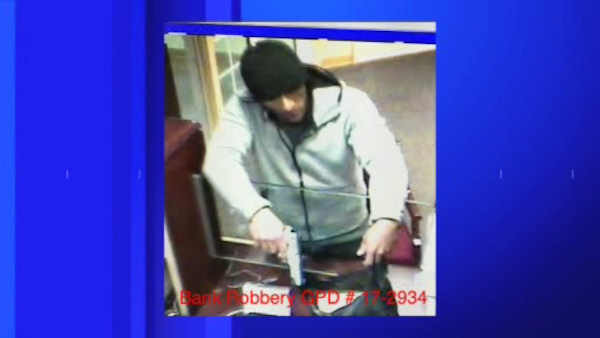 NEW YORK (WABC) -- Police are hunting for a bank robbery suspect accused of leading police on a chase from Connecticut to New York. Investigators say the man robbed a bank at gunpoint Wednesday in Greenwich, fleeing with cash. Shortly after the robbery, a police officer spotted his car and tried to get him to pull over. Police say the man refused, and continued into New York, where he crashed into another car in Port Chester, then abandoned his car and ran off. The suspect is described as a white male, 5' 5" to 5' 7" tall, average build, wearing a winter hat, a gray hooded sweatshirt, dark pants, light colored sneakers. The suspect also attempted to obscure his facial features by applying some sort of dark colored makeup.